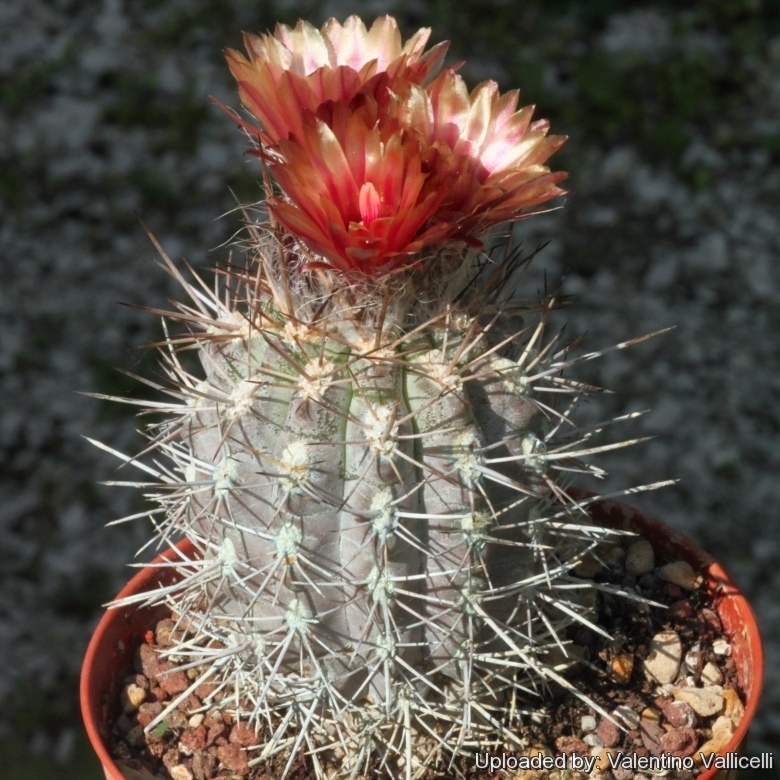 Accepted Scientific Name: Eriosyce heinrichiana var. simulans (F.Ritter) Katt. Origin and Habitat: Eriosyce simulans is endemic to the region of Coquimbo, Chile, from the system of hills and plains of El Trapiche in the north to the Choros Creek in the south, and westward without reaching the coast. It is known from less than five known localities. Extent of occurrence less than 10 km2. Habitat and ecology: Terraces, slopes and summits of the hills together with Copiapoa pseudocoquimbana and Eulychnia acida. Despite its very restricted distribution, it is locally abundant. It reproduces only by seed that are usually dispersed near the mother plant. Major current and potential threats: Habitat loss due to road construction, collecting plants for horticulture and grazing of cattle and goats, in particular young plants are eaten or trampled by goats. Unsustainable tourism. 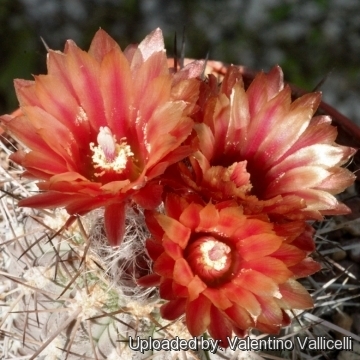 Description: Eriosyce heinrichiana var. simulans (Neochilenia simulans) is a peculiar cactus species often with elongate grey-green stems with long white wool covering the stem tips. The stems and spination simulate in colour and texture the copiapoas that surround them. It shows beautiful red flowers in spring. Individual plants of this species shows a certain degree of variability depending on origin. Stem: 4-10 cm in diameter, simple, globose becoming somewhat elongated-cylindrical and branched with age. Epidermis grey-green. Ribs: Noticeably tubercled with pronounced chinlike protrusions. Areoles: Orange brown with grey felt. 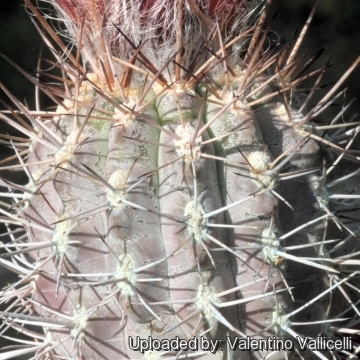 Spines: Stiff, needle-like, straight and not easily distinguished as centrals or radials. Dark grey. Radial spines: 8-12, slightly stronger 1-3 cm long. Central spines: 1-4, weaker 2-4 cm in length. Flowers: Diurnal, campanulate, 4 cm long and broad, closely packed apically from young areoles, bright red often with red/brownish midveins. Pericarpel and floral tube with bracts, wool and sparsely bristly. Fruit: Reddish, fleshy, thin walled and splitting open by a basal pore generated by the detachment from the areola. 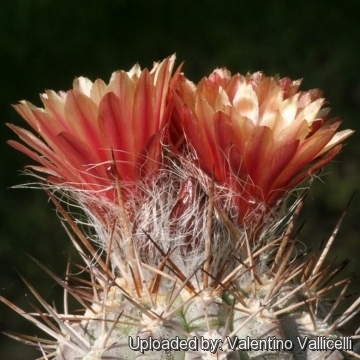 9) Pyrrhocactus simulans in: <http://www.mma.gob.cl/clasificacionespecies/fichas8proceso/fichas_finales/Pyrrhocactus_simulans_P08_propuesto.pdf> Downloaded on 01 May 2014. Cultivation and Propagation: Eriosyce heinrichiana var. simulans is a slow growing but relatively easy to grow species, providing they are kept dry during autumn and winter and rot prone if kept in a non ventilated place.